Clusters: Horrible lash damage is very common from clusters! False advertising when called “individuals”, these “clusters, flares, and semi’s” are the worst for your natural lash health!!!! Cluster lashes are not applied individually to your natural lashes. They are glued to a bunch of your natural lashes, and use lots of thick glue to hold them in place. The problem: this disrupts your natural lash shed cycle. All the lashes that are glued together will keep growing at different rates. 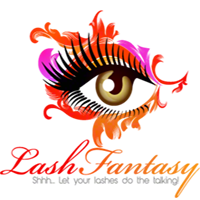 The faster-growing lashes will pull on the follicles of the slower growing lashes, causing such issues as: a burning/itching sensation, twisted flipped lash extensions, styes, eye infections, and the most common side effect: follicle damage/trauma resulting in thinned out lashes, and bald spots where natural lashes will stop growing. Our natural lashes need to be able to shed independently of each other. When clusters are applied (slathered in glue, often of unknown origin, and pressed to multiple lashes), damage and discomfort are GUARANTEED. Can you see how much adhesive is used and how natural lashes are literally smothered, unable to grow, or be washed properly, or even move? These lashes are the worst culprit of lash damage and a reputable lash lounge won’t offer them!